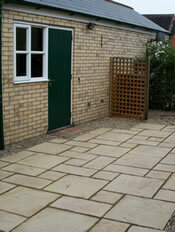 About RW Landscapes - Innovative Garden and Landscaping Solutions - Hitchin, Hertfordshire. RW Landscapes is an innovative landscaping service based in and serving the Hertfordshire/Bedfordshire area and consists of a friendly, professional team who take pride in their work, ensuring every job is completed to the highest of standards. Each project is supported with expert advice from design conception to installation, including after care. Our staff are knowledgeable on an extensive range of designs and materials from traditional to modern. All work carried out is guaranteed for five years under our company policy. Customers and employees are covered under our public liability insurance so you can rest assured your garden will be of the highest quality. covering all aspects of landscaping from garden clearance to fully project managed new designs. RW Landscapes are now Marshalls Register Approved Landscape Contractors and Driveway Installers.